C: Is India a country you've had on your list of places you'd like to visit? S: Yes, I've wanted to go for a few years. C: Was there a particular aspect of the country or culture that caught your interest? S: Yeah, the Holi festival, which for several reasons I didn't get to experience on this trip - because it's earlier in the year, I believe, and also it's a Hindu thing, so I probably won't experience it. But that's what caught my attention initially - and that I love saris. I've seen pictures of them, and of the bindis, and I've always thought they were very, very beautiful. C: So, the vibrancy of the culture that's expressed outwardly? C: And obviously, the monkeys caught your attention. S: Of course - the monkeys! And the elephants - i haven't seen those yet, but i'm still hoping! C: So, having arrived in India, stayed with and travelled with friends and local family here, have you seen what you hoped to see, or even perhaps in a different way than you expected? S: Yah, it's been really, really fun to see day-to-day life and how some people dress very modernly but the women especially embrace that older, traditional kind of look. It's been great being in India, and seeing how people match the culture you see in films and books and also how different many are from what you might have expected. C: Have any one-on-one conversations with people here who you've gotten to know a bit given you a different perspective or insight than you had or revealed something that surprised you? C: There are certainly things we'd never see in a city of this size [750,000 population] at home, yet it's very functional. So, we attended several church services with friends, in different locations. Anything there that surprised you? S: I think I was a little thrown off by how small the Nagrakata church was - not that I expected it to be big, just that it was rows of two chairs on one side and of one chair on the other side, so I was like, oh, okay, we're getting nice and intimate in this one! But also how great their energy was and how very upbeat and fun their attitudes were. They were very open and seem to be transparent and willing to learn and incorporate [worship and teaching] into their lives. C: Has anything been pulled out of you, out of your spirit, that surprised you by the inner work that God might be doing in your life? C: More at: Have you been stretched by anything you 've been asked to do? S: I have been stretched - I'm not used to praying over people or praying blessings over people, so that's been stretching me. Even coming on the trip was a stretch for me because I'm not usually someone to say, "Hey, let's go do this!" or "Hey, I wanna do this!" and it working out. Usually, I let people come to me - it's a sense of insecurity I have that comes out about things like that, where i have a sense of inadequacy, whereas if people come to me, then I know that more than likely I'm going to be prepared for it. But going TO people is putting myself out there in a way I'm not used to. So being able to pray over people was was a big first time experience for me. I don't ever pray for people unless we're in a circle [at church] and someone is like, "You're going to pray for this person and you're going to pray for that person.". C: For myself, on this same topic, sometimes I've been sort of pleasantly surprised and thought, "Oh, listen to THAT!" as words are coming out of my mouth - not anything I'd premeditated - and then watching peoples faces you can see that "Wow, I think God's doing something here!" Have you observed anything along those lines while praying? C: That concept of stretching again? S: Yah - getting more comfortable in trying to listen to what God is trying to tell me to say or do, and not getting in His way by getting in my own way, just in general. C: Do you think it's built your confidence in understanding that it doesn't have to be perfect or we don't have to be perfectly qualified? C: "I've got a little buffer zone here, God...!" S A little bit of a buffer zone where I can say things and there's a chance they don't know what I'm saying....but, no, I think that does allow me some confidence because if I mess it up, how would they really understand, as long as they can feel God working or that they know I'm trying to pray for them? 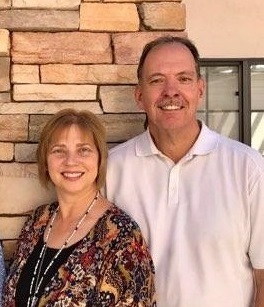 C: And it helped that Pat and Gary gave us some coaching, to not feel any pressure, and that we're always safe to pray a blessing from the Lord's Word over each person. S: Yes, that was very helpful. C: All right - any other comments, questions... anybody? Nobody? S: Well, then, we're gonna call that a wrap - and thanks for coming! Yes, I am eating sugar - to tame the spicy hotness!